An installation for the Shenzhen & Hong Kong Biennale of Urbanism/Architecture takes the form of an urban farm, with the purpose of educating city residents about the land required to grow the food they eat. The installation, Landgrab City, is divided into plots proportional to the different types of food consumed (vegetables, cereal, meat and more). The installation is credited to Joseph Grima, Jefffrey Johnson and Jose Esparza – Grima is the director of the always interesting Storefront for Art and Architecture. "Conceived as an experimental investigation into the full extent of Shenzhen’s spatial footprint, the installation is comprised of two parts: an map of one of the city’s dense downtown area, home to approximately 4.5m people, and a plot of cultivated land divided into small lots." 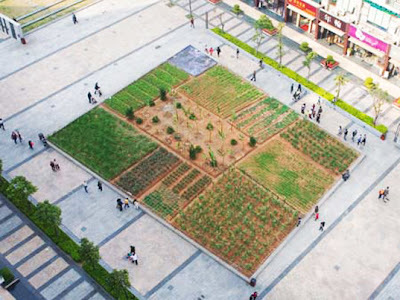 According to the exhibit, Shenzhen's population requires 137,665 hectares of farmland (or 531 sq miles) to sustain them! This equals 0.8 acres per person, a relatively conservative estimate of land use, and small indeed compared with the estimated land needed to support the current American diet - 1.2 to 1.5 acres per person! The installation is a visually striking way to get people thinking about the relationships between city, farm and sustenance. As we reconsider our spatial relationships to food production we might begin to question whether our current development patterns are wise - that is, will we have enough land left to grow on?